Does your lawn need a little help? Are you envious of your neighbors “golf course’ look? Rapid Gro Overspray is your answer. A beautiful lush carpet of emerald green grasses is our guarantee. All our products are available in an organic option. This ‘extra peace of mind’ will not compromise the finished product. We guarantee the results. Ask for “Organic Rapid Gro” when placing your order. Rapid Gro Lawn will make you the envy of your neighbors. 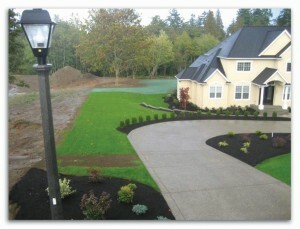 Briar Group Inc. provides you with a site-specific turf seed mixture at no additional cost. Whether your site is sunny, shady, or a bit of both, the blend of grasses in Rapid Gro Lawn will be appropriate. Rapid Gro Lawn©, the fastest performing turf product on the market, is our most popular lawn application. On your prepared soil, Rapid Gro Lawn is as simple as water and watch it grow. If we compare Briar Group’s Rapid Gro Lawn product with other hydroseeded lawns on the market, we find that Rapid Gro Lawn produces 2,386,100 more grass plants per 1000 square feet. This is why our Rapid Gro Lawn is denser from the first mowing.